In our 100-Day Spotlight on the Trump administration: The president announces his pick for the Supreme Court. We’ll look at the nominee and confirmation battle ahead. Pam Karlan, professor of public interest law at the Stanford Law School, where she is also the co-director of the Supreme Court Litigation Clinic. NPR News: President Trump Nominates Neil Gorsuch To The Supreme Court — "Gorsuch has often drawn parallels to Scalia, with SCOTUSblog calling their similarities 'eerie.' In accepting Trump's nomination, Gorsuch praised the late justice as a 'lion of the law' who was cherished by his colleagues for his "wisdom and his humor." Los Angeles Times: Neil Gorsuch could fall somewhere between his hero, Justice Scalia, and former boss, centrist Justice Kennedy — " Like Kennedy, 80, Gorsuch is a Westerner with a polite, congenial manner who at times has won praise from liberals. He may be more conservative than Kennedy when it comes to expanding individual rights, but he seems to lack Scalia’s fervor for overturning liberal precedents from decades past." SCOTUSblog: Trump nominates Gorsuch to fill Scalia vacancy — "After originally suggesting that the nomination would come on Thursday of this week, yesterday Trump revealed in a tweet that the nomination instead would be broadcast live this evening. 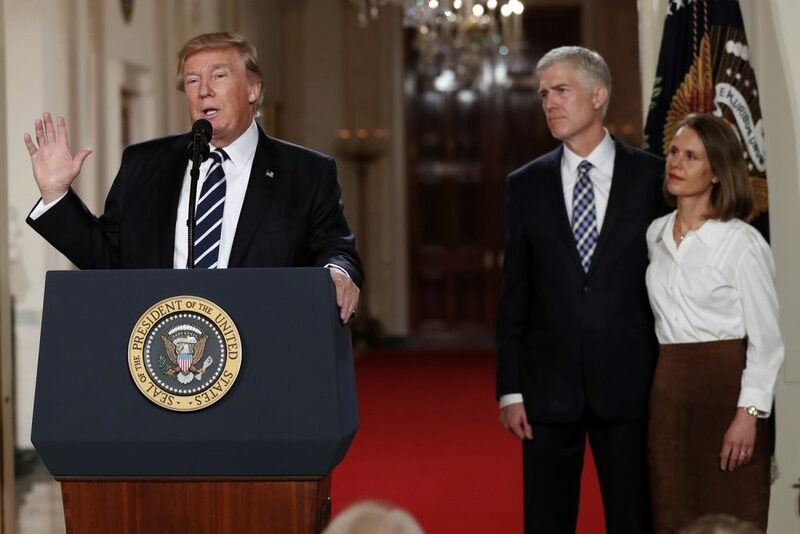 And today the nomination announcement seemed to take on a reality-television air, with rumors circulating that both Gorsuch and Judge Thomas Hardiman of the U.S. Court of Appeals for the 3rd Circuit, who was also believed to be a finalist for the job, had come to Washington without knowing which one would ultimately be selected." This program aired on February 1, 2017.